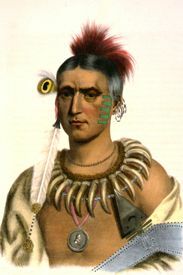 Ma-Has-Kah or White Cloud, an Ioway chief by Charles King, 1837. The Ioway tribe, also known as the Iowa and Baxoje, are a Native American Siouan people. Their name was thought to have been borrowed by the French from Ayuhwa, the Dakota term applied to them, which, signifies “sleepy ones.” They called themselves Pahodja, which means “dusty noses.” With the Missouri and the Otoe, the Ioway were the Chiwere-speaking peoples, claiming the Ho-Chunks (Winnebago) as their “grandfathers.” The state of Iowa, where they once lived, was named after them. This tribe’s single origin with the Winnebago, Otoe, and Missouri is borne out by the close linguistic relationship between them. Rather specific migration legends have been preserved giving an account of the movements of this tribal complex and the time and circumstances of the separation. According to tradition, after separation from the Winnebago, the Ioway-Otoe-Missouri mother tribe moved first to Rock River, Illinois, near its junction with the Mississippi River, and then to the Des Moines River some distance above its mouth. After separating at the Iowa River into two bands, one which became the Ioway, moved to the northwest. The Otoe-Missouri went on to the mouth of Grand River, where part remained becoming the Missouri while the rest, the Otoe, went on westward up the Missouri River. The Ioway continued to roam about the region, later moving into the northwestern part of the state around the Okoboji Lakes and probably extended into southwestern Minnesota to the neighborhood of the Red Pipestone Quarry and to the Big Sioux River. In the latter part of the 18th century they passed over to the Missouri River and settled south of the spot where Council Bluffs now stands. About 1760 they moved east and came to live along the Mississippi River between the Iowa and Des Moines Rivers. Their principal town was on the Des Moines River and for a long time, at a spot in the northwestern part of Van Buren County. Early in the 19th century, part of them seem to have moved farther up the Des Moines River while others established themselves on the Grand and Platte Rivers in Missouri. At this time they seem to have come into contact with the Dakota and to have suffered considerably in consequence. Their estimated population in 1760 was 1,100; however, this number had dropped to only about 800 by 1804, decrease caused mainly by smallpox, to which they had no natural immunity. In 1814 they were allotted lands in what was known as “the Platte Purchase” extending from the Platte River of Missouri through western Iowa even to the Dakota country. By treaties signed on August 4, 1824; July 15, 1830; September 17, 1836; and November 23, 1837, they ceded all of their claims to lands in Missouri and Iowa, and by that of the Treaty of Prairie du Chien, signed on August 19, 1825, they surrendered all claims to land in Minnesota. Another treaty in 1836 assigned part of them a reservation along the Great Nemaha River, in present-day Richardson County, Nebraska, and Brown County, Kansas, but, it was considerably reduced by treaties made on May 17, 1854, and March 6, 1861. Later, part of the tribe was removed to Oklahoma to find homes in the present-day Lincoln and Noble Counties. Later, the Oklahoma tract held by the Ioway was granted to its occupants in severalty. Today they are enrolled in either of two federally recognized tribes, the Iowa Tribe of Oklahoma and the Iowa Tribe of Kansas and Nebraska. Compiled & edited by Kathy Weiser/Legends of America, September, 2014.